*How do I create a CUNY portal account? When should I look at my DEGREEWORKS audit? When should I use DEGREEWORKS? How is a DEGREEWORKS audit different from a transcript? How do I use “WHAT IF” Planning? “DEGREEWORKS” is a computerized degree audit program and academic advising tool designed to assist you and advisors in reviewing your degree progress. A Web-based program, DEGREEWORKS re-organizes your transcript chronologically and categorically, easily identifying courses you have completed and what courses you still need in order to fulfill your degree requirements. Be advised that DEGREEWORKS is not your academic transcript nor is it an official notification of completion of degree requirements. Determine what JJC requirements you need to fulfill in order to complete your degree. Identify what requirements you have completed or in-progress. View individual course grades and cumulative grade-point average (GPA). See how your coursework could be applied toward another major by using the What If feature. Project grade performance using the GPA calculator. Determine whether there are holds or stops on your record. Plan future course schedules utilizing the Planner option to see how your selections will affect the progress towards your degree. Learn the prerequisites and corequisites for undergraduate courses by clicking on the course numbers. It is very simple! Go to CUNY Portal login at www.cuny.edu. If you do not have a CUNY portal account, follow the directions below to create one in order to access the DEGREEWORKS program on the site. Log on to the CUNY portal homepage at www.cuny.edu. Click on the Portal Log-in link in the left column. On the New User Registration screen, select the option that best describes your affiliation with the college (student, faculty, etc.). On the User Validation screen, enter your last name, Social Security number, and date of birth. Click on Next, then confirm the information you entered by clicking Confirm. You will now see a screen on which you can change your username, create a password, and enter an email address. Be sure to list an accurate email address since the CUNY help desk will use this address in case you forget your password. Write down your username and password and store it in a safe place. Once you have entered the needed information, click the Save tab. Enter your username and password and click Log-in. The My Page screen will open and you will be logged onto the CUNY portal. Go ahead and select the Student Advisement/DegreeAudit (DegreeWorks) link. http://jstop/index.php and select the “Graduation Audit” link. The Graduation Audit application should be submitted during the first two weeks of your final semester and before each semester’s deadline. WHEN SHOULD I LOOK AT MY DEGREEWORKS DEGREE AUDIT? Anytime! DEGREEWORKS is accessible 24 hours a day, 7 days a week from most networked computers. Before meeting with an academic or major advisor, go to the Web and print out your audit. Before registration, print out your audit and use it to plan your program for the semester. After registration, confirm that the courses selected complete the requirements you still need. View your audit after grades are posted. Before you file for graduation, review your academic record. WHEN CAN I USE MY DEGREEWORKS AUDIT? Deciding whether to add a minor. HOW IS A DEGREEWORKS DEGREE AUDIT DIFFERENT FROM A TRANSCRIPT? 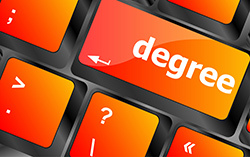 DEGREEWORKS is not your academic transcript nor is it an official notification of completion of degree requirements. Changes made to your official JJC academic record will take at least 24 hours to be reflected in your DEGREEWORKS audit report. This progress report does not supersede the John Jay College of Criminal Justice Catalog and/or amendments passed by the CUNY Board of Trustees. If you are receiving New York State Financial Aid (TAP), please review your courses and your choice of major with an advisor before submitting a change of major form. HOW DO I USE “WHAT IF” PLANNING in DEGREEWORKS? Click on the "What If" button. Select the degree you are considering. Select the catalog year that matches your first term enrollment at the College or the most current catalog year available. Click the 'Process Audit' button. Review carefully how your courses would count in this new major. Discuss this new major with an academic counselor or a major advisor. Decide if you want to change your major. Follow JJC procedures to change a major via the J-Stop. *(This FAQ has been created using information from the CSI DegreeWorks FAQ guide.) All questions concerning DegreeWorks should be directed to the Registrar’s Office in BMW Buidling, 6th Floor, Room 600B.